You will be given a reference e-book to read which has 387 pages And the test will be based on that e-book , you can take final test within 1 year of purchase. Guerrilla marketing refers to that advertising strategy which utilizes low-cost unconventional means such as flash mobs, graffiti and sticker bombing in a large network composed of individual cells or within a more localized fashion with an aim of promoting or conveying products or ideas. The use of guerrilla marketing as an advertising strategy can actually be linked to guerrilla warfare which takes advantage of atypical techniques with an aim of achieving goals in an unforgiving or extremely competitive industry or environment. The guerrilla marketing concept actually started as a very unconventional method of promotion which heavily relies on imagination, time and energy instead of relying into a huge budget for marketing. Guerrilla marketing certification holders is aware of the fact that this advertising strategy uses unconventional, unexpected and interactive marketing campaigns that aim to target present and potential customers in unexpected places. If you wish to earn a guerrilla marketing certification, then you have to keep in mind that the major objective of this strategy is to make sure that a unique, thought-provoking and engaging marketing concept guaranteed to produce a buzz and turn products, services and ideas into viral is created. It involves the use of unusual approaches and methods including intercept encounters in public areas, PR stunts and any other unusual marketing method designed to help business owners achieve profitable results while investing the least number of resources. This strategy is also more focused on using creative marketing strategies that are proven to be affordable. It also aims to retain present customers instead of generating new ones. 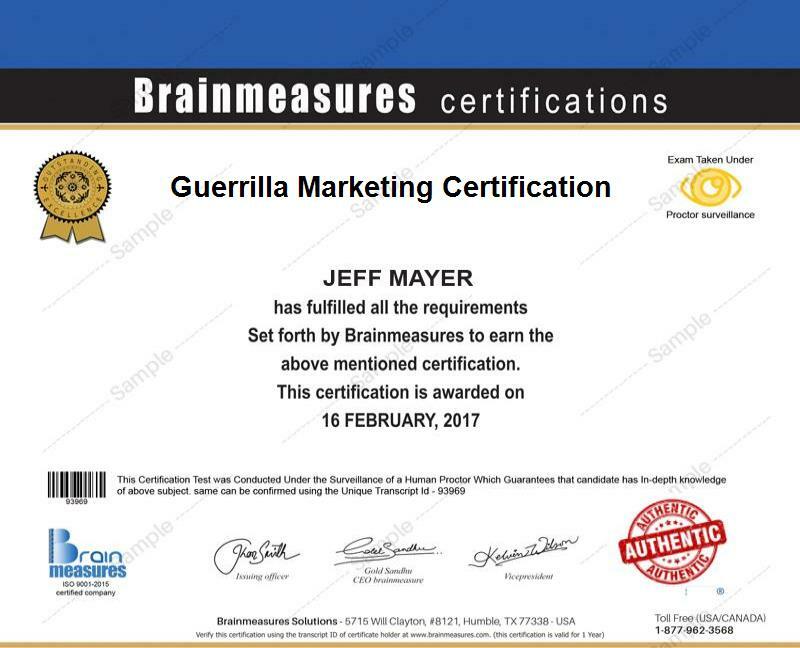 People who are working in the marketing department can be greatly benefited by the guerrilla marketing certification program from Brainmeasures. This certification course can work perfectly for you if you are planning to market your products and services in a more unconventional way while making sure that your marketing campaigns continue to have a huge impact on your target audience. Holders Salary for guerrilla marketing certification holders is proven to be more stable. You can expect your average annual salary as a certified guerrilla marketing expert to be around $77,000.